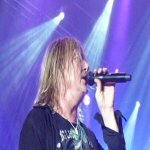 Def Leppard singer Joe Elliott was interviewed on 18th July by Andy Preston of 98.7 Gater FM radio and he talked about the new album and a second residency. Joe mentions the current plans for a second Las Vegas residency which has now changed from the start of 2015. This always seemed unlikely given the new album release and world tour plans. "Yes we are gonna go back and probably do VIVA! Pyromania but it'll not be till towards the end of next year because we've got a new record in the making." "So I think if KISS are gonna be in this November I think we're gonna be in November 2015 back in Vegas again."